A Man of No Country is a fictionalized biographical novel by author Gretta Curran Browne. It is the fifth book in a series chronicling and dramatizing the life of the British poet and writer Lord Byron, carefully researched and based on the evidence of his life and the writings of his peers. In this installment, which can be read as a standalone volume, we join Byron in Switzerland as he says goodbye to life in England. This is where he meets Percy Bysshe Shelley, Mary Godwin (aka Mary Shelley) and Claire Clairmont. The story follows the journey of an incredible summer of creativity, passion and art in a bittersweet summer that was iconic to Byron’s life. Gretta Curran Browne is clearly devoted to her topic, and she writes with vivacity but also the discipline of a historical master. As an English Literature graduate and a writer myself, Browne brought my fondness for the Romantic Movement to life in a whole new way by supposing what those summer days were like for Shelley and Byron. Mary’s creation of a Frankenstein was a well-constructed sideline to Byron’s personal journey, and I learned a lot about some of his lesser known works that I’d never encountered before. The setting is beautifully atmospheric and the text transfers seamlessly between Browne’s beautiful prose and the real words and works of the time. 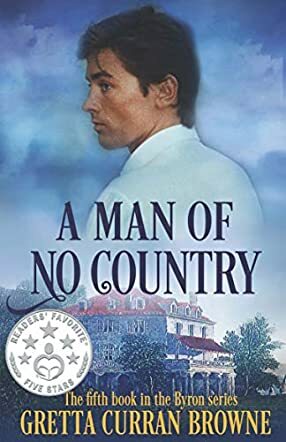 Overall, I’d consider A Man of No Country a must-read for fans of the Romantic Movement, and indeed any fans of well researched historical fiction.